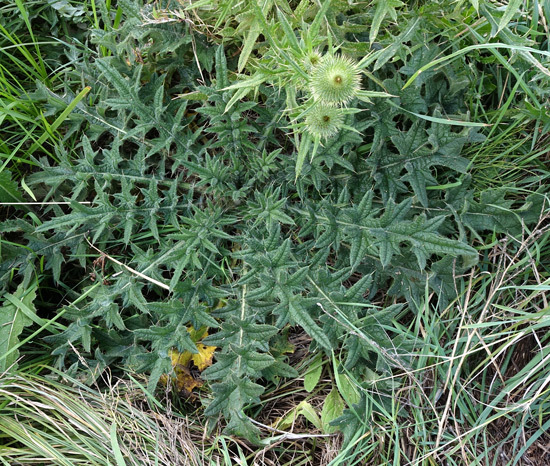 There are several dozen Thistles, native and introduced, in the Four Corners area. 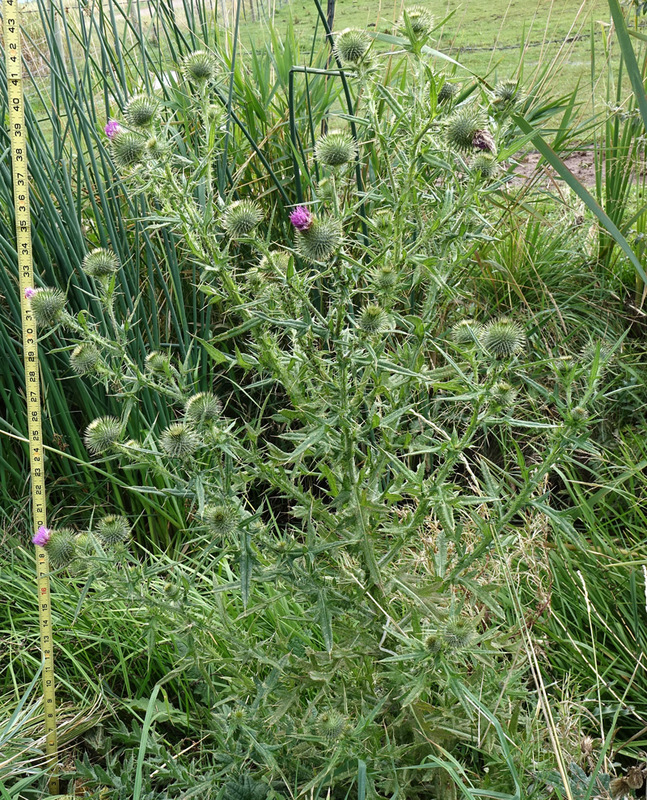 Some of these Thistles reproduce from rhizomes; others are biennial, reproducing from seeds. All are spiny and have only disk flowers. 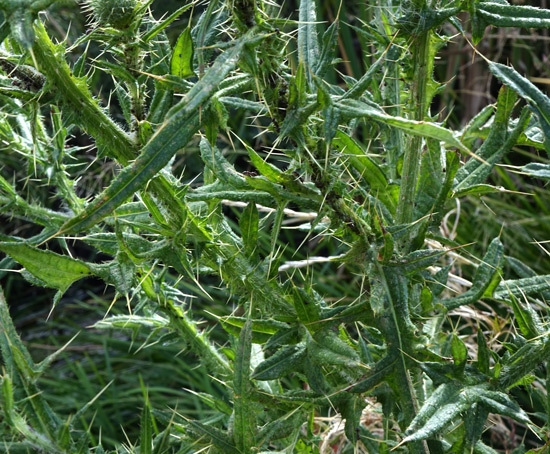 Most Thistles are large and very visible in plant and in flower. 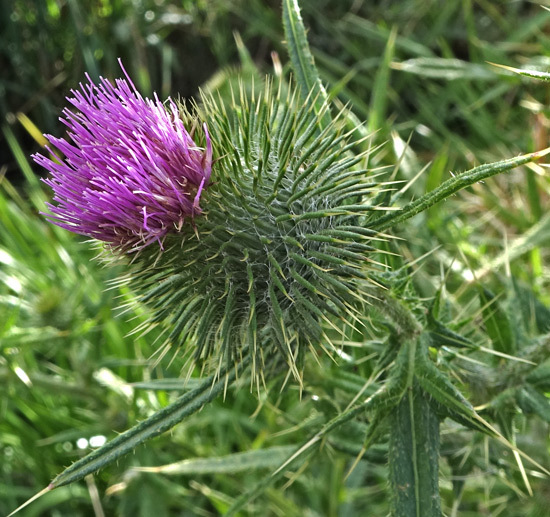 Some non-native Thistle are serious invaders of meadows and pastures. Semi-desert, foothills. 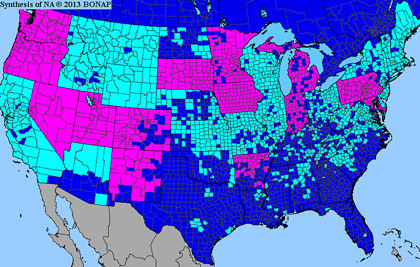 Disturbed areas, pastures, roadsides. Summer, fall. Near Yellowjacket Canyon, October 1, 2014. 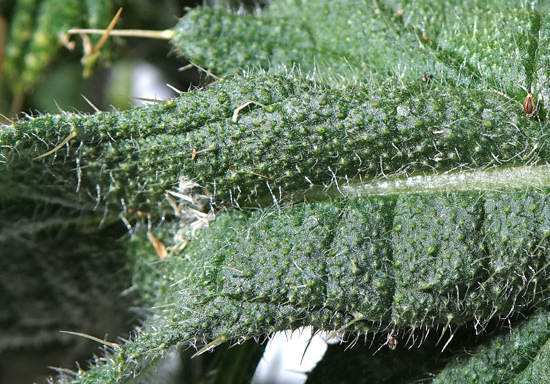 This biennial monster of prickles grows to four feet tall in a mass of criss-crossed, heavily armed leaves. Flower heads are often smaller than the involucre, which is composed of scores of very narrow, spreading phyllaries. As the photograph above shows, plants branch and spread toward the top and they are topped by numerous flower heads. Cirsium vulgare was at first named Carduus lanceolatus by Linnaeus in 1753 and after several other renamings was named Cirsium vulgare by Michael Tenore in 1835. 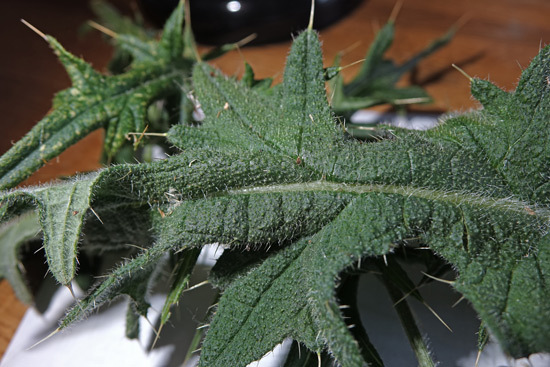 The lower leaf surface appears quite different from the upper surface. because the hairs are long, twisted, clear, and multicellular. 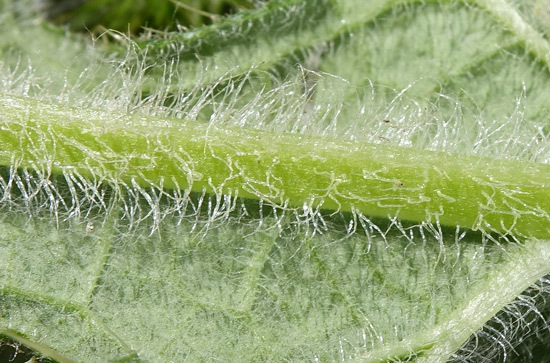 The hairs are relatively upright along the strong central vein, but on the leaf surface the hairs are so matted and thick that the surface appears light green. This basal rosette, matted to the ground immediately next to the plant at the top of this page, is over two feet in diameter. 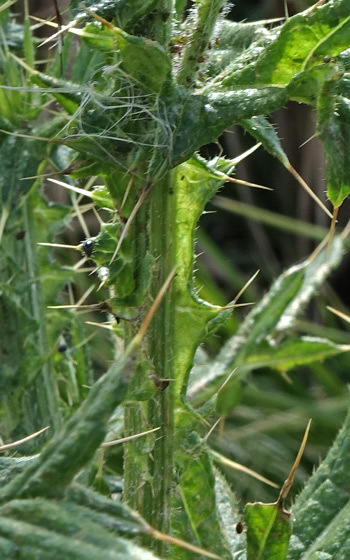 One doesn't reach into the interior of Bull Thistle! Stems are sometimes winged as the brightly lit green in the center of the photograph illustrates. 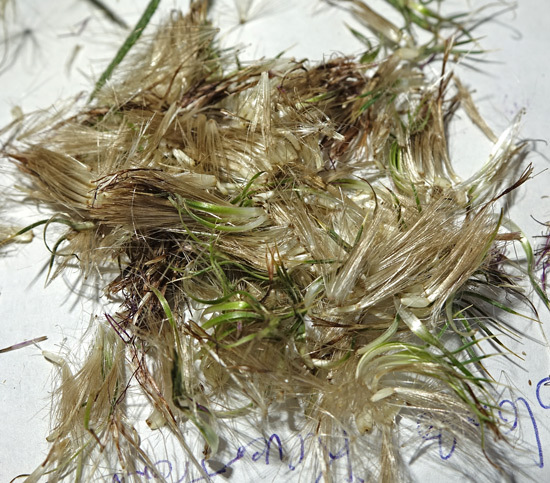 The jumbled pile in the top photograph to the left is not clippings from my haircut; it is a two inch diameter mass of seeds and pappus hairs from just one Cirsium vulgare flower head. 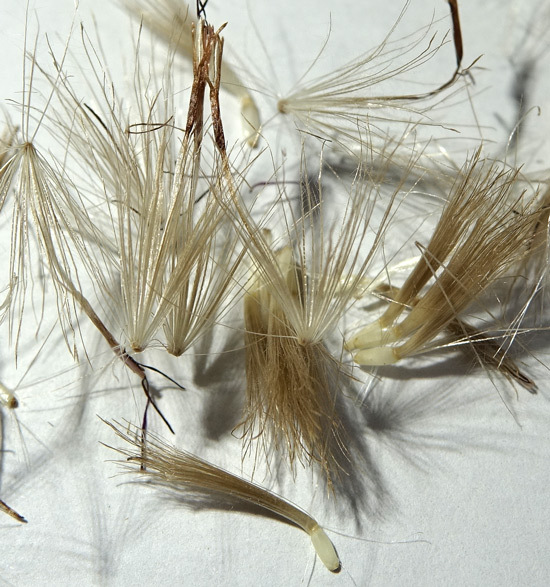 The second photograph at left shows individual white seeds topped by the plumose (feathery) pappus hairs. The darker cylindrical parts at top left and right in the photograph are several dried disk flowers.